Baesuk, as its name indicates, it’s cooked pear (“bae” = pear” and “suk” = cooked). There are 2 types of baesuk: steamed whole pear and cooked pair punch, like sujeonggwa. 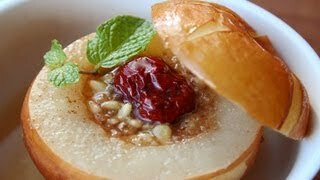 Today I’m showing how to make the steamed pear, sometimes called baejjim (“jjim” = steamed) or baekkuljjim. Since I posted my ginger tea recipe and explained that it’s a home remedy for colds, stomachaches, and nausea (it sounds like panacea, yeah? ), many people have asked me to post more recipes that are not only delicious but have medicinal qualities and are healthy. Baesuk is great for colds, especially sore throats and coughs. It’s also a delicious sweet snack or dessert. Yes, it’s very delicious! I love the texture of cooked pear. I’m going to show you how to make baesuk with a Korean pear, and also with a small bosc pear, which is easier for some people to find and is the perfect portion for a dessert. Enjoy the recipe and please let me know how yours turns out, and how you serve it to your loved ones. Rinse the pear in cold water and pat dry. Make a lid by slicing 1 inch off the top. Scoop out the core and the seeds with a small spoon. Put the sliced lid back on the pear and put it in a heat-resistant bowl. In the video I’m using a soup bowl. Steam the pear about 1 hour over medium high heat. If you’re trying to cure a cold, serve it hot, with a small spoon. Otherwise, you can serve it hot or chill it in the fridge before serving. Posted on Friday, December 14th, 2012 at 11:54 am. Last updated on April 26, 2015. Posted December 16th, 2018 at 1:26 pm | Log in to reply. Hi Maangchi, This recipe sound delicious! I was wondering if I can leave the pinenut out since I’m allergic to nut? will it impact the flavor of the dessert? Also, Can use an apple instead of a pear for this recipe? Thank you and Happy Holiday! Posted April 20th, 2018 at 1:07 am | Log in to reply. Posted April 24th, 2018 at 8:29 am | Log in to reply. I never watch Korean dramas because I don’t have time, but you made me watch this one and investigate to see if they really used my photo! That’s right, they did! Thanks for letting me know! Posted December 10th, 2017 at 11:39 am | Log in to reply. Thanks for this recipe Maangchi!!! This is so useful for this time of the year!!! Would you have any recipes using the Instant Pot ? I would love to make this and many of your recipes in an instant pot, thanks again for sharing your delicious recipes !!! Posted November 10th, 2017 at 2:03 pm | Log in to reply. I remember my mom making this for me when I’d have to stay home from school with a bad cough. I was trying to remember how to make it for my sick husband when I stumbled across your recipe. Thank you for this! Posted August 10th, 2015 at 2:52 pm | Log in to reply. P.S. I bought a bag of pine nuts at Trader Joe’s. They have the best price! Posted August 10th, 2015 at 2:50 pm | Log in to reply. Now this is my favorite dessert treat! I put it in the fridge for a few hours. It’s so delicious! The jujubes and pine nuts make it so good. Healthy too! Posted August 13th, 2015 at 7:22 am | Log in to reply. It looks gorgeous! I’m glad you like baesuk a lot! Yes, it’s sweet soft and a little crispy! Posted November 28th, 2014 at 6:19 am | Log in to reply. Can’t wait to make it. Almost all the ingredients can be found easily in my country except for the pine nuts. Can I use any other nuts such as peanuts, cashew or almond? Or should I skip it? Posted November 29th, 2014 at 7:13 am | Log in to reply. Peanuts sound great to me. Chop them into small pieces before using. Good luck! Posted February 26th, 2013 at 8:30 pm | Log in to reply. I couldn’t wait any longer and pulled out my pears from the steamer at the 25 min mark! :) it was SO GOOD!! The flavors were really warm and comforting, I love that the pear was soft but still kept it’s shape. ^__^ yummy!!! Definitely making this dessert for my father in law :) and parents. Posted February 26th, 2013 at 9:27 pm | Log in to reply. yeah, I guarantee you will impress your father-in-law and parents with your baesuk. Posted December 29th, 2012 at 6:27 pm | Log in to reply. 배숙은 정말 맛있는 것 같아서 한 번 만들어 보고 싶어요. 근데 스티머가 없는데 어떻게 할까요? I would really like to try this recipe. Since I don’t have a steamer, do you think it’ll be possible to cook the pears in the oven? Posted December 29th, 2012 at 7:40 pm | Log in to reply. You can make baesuk without a steamer. In a pot, add a few cups of water. And place pear filled with honey mixture in a heat resistant bowl. And place it in the pot and cook it. Good luck with making delicious baesuk! Posted December 27th, 2012 at 1:12 pm | Log in to reply. I made this for my parents over the holidays, and they were really impressed! It turned out perfectly, and the filling was delicious. I did make the carving a bit narrow… I think I will make it wider and fill it back with the fruit like you did. Thank you, and happy new year! Posted December 29th, 2012 at 7:42 pm | Log in to reply. Posted December 20th, 2012 at 12:21 am | Log in to reply. These look wonderful! I HAVE to make these. It can’t be a coincidence that my sister just gave me a box of Korean pears and that I actually have all the other ingredients (except the optional jujubes). I even have the pine nuts, that I have never bought before, but just got for the first time to try to make the Maejakgwa (Ginger cookies). I think I will try to find the jujubes though, since I have never tried them before. Thanks a lot for the recipes! Posted December 21st, 2012 at 12:46 pm | Log in to reply. wonderful! Let me know how your baesuk turns out. Posted December 23rd, 2012 at 7:29 pm | Log in to reply. It took a bit of searching, but I’m glad I decided to use the jujubes. They were really good. I’ll probably try making it again, this time making sure I don’t over do it with the ginger. Posted December 23rd, 2012 at 7:50 pm | Log in to reply. Posted December 19th, 2012 at 10:34 pm | Log in to reply. So good! It’s been rainy and blustery for several days so today I made baesuk. I had been wanting to make ever since I saw it mentoned on a drama. I know I will make this often over the winter season… hopefully not because I have a cold, but because it is so delicious and warming! ^_~ Thanks! Posted December 18th, 2012 at 12:58 pm | Log in to reply. Maangchi, I love watching your how to videos. They are very easy to follow, step by step. I tried making the Baesuk. It turned out very delicious. The Bosc pears were not in season at the store, so I had to substitute with the Bartlett pear. Posted December 15th, 2012 at 2:52 am | Log in to reply. Posted December 16th, 2012 at 12:57 pm | Log in to reply. Welcome to Korean cooking! : ) Yes, baesuk will be a good dessert for Christmas dinner. Let me know how yours turns out. Posted December 14th, 2012 at 3:35 pm | Log in to reply. This recipe was originally posted on December 14, 2012 at 11:54 am by Maangchi. It was last updated on April 26, 2015. The video was watched 280,169 times on YouTube & has 3,663 likes!